This post is by Petra Shepherd. Petra is a freelance travel writer who spent 30 years in television, 19 with Travel Channel. Although not a mum herself, she has 10 nephews and nieces and 12 god-children, many of whom are teenagers who happily accompany her on trips. You can follow Petra on Twitter: @petra_shepherd. Santa Eulària des Riu is the second largest of Ibiza’s five municipalities and is located on the Spanish island’s eastern shore. The area encompasses an impressive stretch of coastline and has more than 20 beaches as well as rural farmland. I stayed at two contrasting hotels during my stay in the town of Santa Eulària. Hotel Riomar is located just metres from the beach, with magnificent sea views. On the other side of the bay Aguas de Ibiza is a luxury design hotel with a free spa, outdoor pool and rooftop bar with views of the marina and the island of Formentera. This five star, all-white, contemporary hotel would make an excellent choice for an adult-only break away from the kids. It’s a corner of the island which is far removed from the clubs of San Antonio, with a brand of tourism that is respectful to the environment while honouring local roots and traditions. The sea grass which grows on the seabed here keeps the waters of the region’s pristine beaches crystal-clear. Those visiting the beach at Santa Eulària can access free Wi-Fi, and the plan is to roll out this service across further beaches in the region. 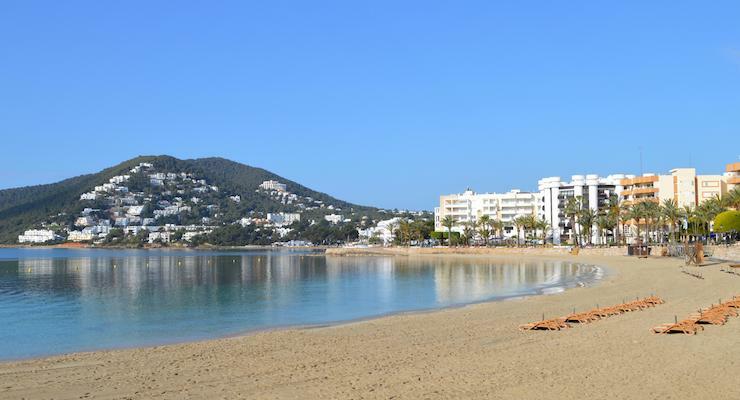 One of the best beaches on the whole island is Es Figueral, which is 10 km from Santa Eulària and offers stand up paddle boards, canoes and pedalos. It’s also home to the Invisa Figueral Resort, which includes Invisa Hotel Club Cala Verde, Invisa Hotel Club Cala Blanca and Pirate Island, a water park that looks like enormous fun for both adults and children. Es Canar is another popular beach, with a wide range of water sports, restaurants and souvenir shops, as well as the chance to jump on a ferry to Formentera for the day. When the wind blows, the beach at Cala Pada is ideal for surfing, whilst my personal favourite was Cala Llonga, a picturesque beach located in a small bay with views of a range of high mountains covered by pine forests. 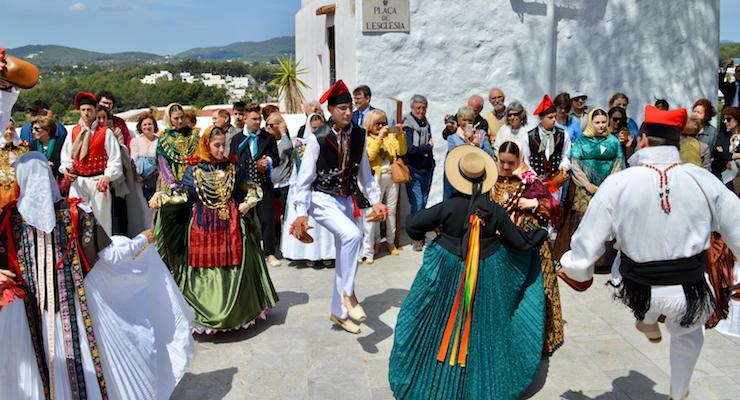 Santa Eulària des Riu was the cradle of the hippy movement which developed on the island in the 1960s, and a trip to the Hippy Market every Saturday at Las Dalias in San Carlos is an absolute must. There is no shortage of stalls selling festival gear, peasant blouses and flower braids at a fraction of the price you’ll find at one of your local chichi boutiques or at summer festivals in the UK. I went crazy for the jewellery, stocking up my present drawer for years to come. The biggest market though is the Punta Arabi Hippy Market on Wednesdays in Es Cana, but it’s more touristy than the Las Dalias market and the quality is perhaps not quite as good. There’s plenty to do for active teens, especially if you’re taking a cooler half term break. 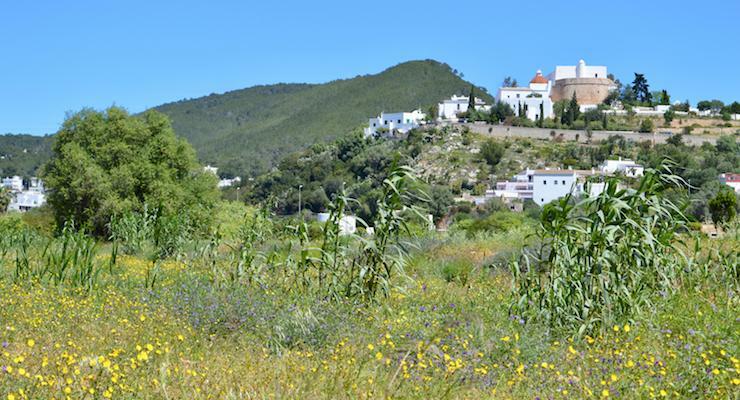 Two of the best ways to discover some of the little coves and hidden corners of Santa Eulària are biking and hiking. Santa Eulària has a network of 12 cycling routes and eight hiking trails designed to accommodate different ages and ability levels. The area is also home to the only golf course on the island, comprising 27 holes. Set in an area of pine trees just 100 metres from Cala Pada beach, Acrobosc Ibiza is the island’s first outdoor adventure park and offers a gamut of fun treetop circuits. If there’s something the Spanish do very well, then it’s their fiestas. The highlight of my visit was the May fiesta, which is celebrated on the first Sunday in May. At the fiesta there are people wearing traditional dress, there’s folk dancing, a long procession of carts decked out in flowers and ribbons, flower shows, and basically folklore fun for all the family. I tend to go to a Spanish fiesta each year (last year I went to the Semana Santa celebrations in Madrid) and this was one of the most joyous and heart-warming I have ever attended. The whole premise of local culture might fill your teen with dread but I saw plenty of teens getting into the spirit of the occasion, being asked to dance by handsome local women and men, joining in the high-kicking, all inhibitions out the window. Pony-mad teens will coo over the miniature ponies and carriages, the proud workhorses and the skittish and headstrong thoroughbreds in the procession, whilst dog lovers will be interested in the parade of “podenco” dogs, the indigenous regional breed. This is an authentic part of Ibiza, and I came across very few (if any) full English breakfast places, fish and chip shops or Irish bars, but plenty of restaurants filled with locals enjoying tasty tapas and the excellent ‘menu del dia’ (often costing only 11 euros for two courses) and authentic paella. The beach boulevard at Santa Eulària also has some of the best gelato parlours I’ve come across outside of Italy. In 1912, the painter Laurea Barrau said of Santa Eulària des Riu: ‘Everything here is more beautiful than I could have imagined. A painter’s entire life can be found here’. This was my first visit to Ibiza and I too found the region to be not only very beautiful (the wild flowers were out in profusion) but also welcoming and warm. More importantly there was plenty to keep a young teen amused on a family trip. British Airways, Easyjet and Ryanair fly from various London airports (Stansted, Luton, Gatwick, Southend, City, Heathrow) to Ibiza, with fares starting from £51.00 return, according to Skyscanner. Aguas de Ibiza Lifestyle & Spa 5* hotel has double rooms from 250 euros per night. Hotel Riomar 2* has standard double rooms from 80 euros per night. To find out more about the area go to the official Santa Eulària Des Riu website. Disclosure: Petra Shepherd was hosted by Santa Eulària des Riu tourist board for the purposes of this review. All words, opinions and images are Petra’s. This post contains some affiliate links, which means that if you click through and book, I’d receive a small commission.